If you search your ancestors in Bivona, Sicilia, info about your Italian family are stored in the City Office archives or at the parishes. In towns and villages of Sicilia and in Agrigento province registry offices were established around 1820: it means that you could find information in Bivona registrar as of that date. So, if your ancestors were in Bivona in the nineteenth or twentieth century, then you could try to contact the City Office of Bivona to know more. 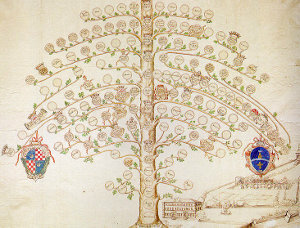 Before to start your genealogy research in Bivona, we suggest you to read our tips for your search . They are useful to search in sicilia and in Bivona too. 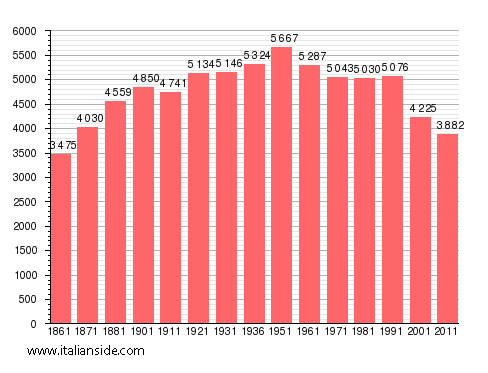 Next picture shows the demographic trends in Bivona from the Italian Unification (1861) an important info to understand how many people lived there in the past. It could be important to know if the last name you are investigating is a frequent surname in Bivona. As more your surname is common in Bivona, as more it could be difficult to find the right info about your ancestors in Bivona archives if you have not exact dates. If you have the opportunity to visit Bivona and Agrigento province, you could plan to investigate churches’ archives by yourself (or with us! ), but from abroad is very difficult to obtain any result unless you find a reliable local help. If you have the opportunity to visit Bivona and Agrigento province, you could plan to investigate churches’ archives by yourself, but from abroad is very difficult to obtain any result unless you find a reliable local help. If your research is in a dead end and you need professional help from our local Italian genealogists write to bivona@italianside.com our expert in Bivona area will study your request and will reply to you with a research plan and a quote. Ciao, mi chiamo Mark Leto. Starei cercando di trovare un certificato di nascita appartenente a mio nonno. Si chiamava Eugene Lato (o Eugenio non siamo sicurissimi sul nome) ed e` nato il 21 febbraio 1871. I am looking for the name of the parents for Melchior Di Filippo who was born in 1727 in Bivona, Agrigento, Italy and died August 11, 1796. I am trying to trace the lineage as far back as I can go. Melchior’s wife was Dorotea Bellone. I would also like information on her parents. Hey is this john tasjian, aunt shirleys son. If so this is your cousin, scott. Ive been researching as well and found the same info. A lot more on my grandmas side, barilla from sinopoli italy. If this isnt you, i think we are still related some how, good luck! I would like to confirm the following, and find out how to get birth certificates for these people. Three of my mother’s grandparents were born in Bivona. Her father’s father was Luigi Marciante born 7 June 1882. His wife was Maria La Mela, was born 13 August 1887. I believe she was born in Bivona but there is a possibility she was born in Palermo. Her parents Francesco La Mela (born 26 Jul 1847) and Rosaria Cardinale (born about 1854), were both born in Bivona as far as I can tell. My mother’s other grandfather was born in Palermo. His wife was Maria La Mela’s sister, Mariana La Mela, born 9 July 1882. Again I believe she was also born in Bivona but I cannot find confirmation of that. GENEALOGIA DA FAMÍLIA BOLLARI (BULLARA) Quando chegaram no Brasil o nome Bullara foi registrado errado e ficou Bollari. ANTONIO BULLARA (Filho de LUIZ BOLLARA e ANTONIETA SPALINI) temos informações de que ele nasceu em 19-11-1894 e faleceu em 13-02-1957. Foi casado com MARIA AMELIA ZAMBONI (Filha de ANSELMO ZAMBONI e CAROLINA ZAMBONI) que nasceu 02-07-1894 e faleceu 29-10-1974. Desembarcaram no Brasil provavelmente no Porto de Santos (+ – em 1920) eles tinham +- 25 anos. O último local dele de residência foi em Bivona, mas não sabemos se ele é nascido lá. Agradeço se puderem nos ajudar. If you would like to start a research in Bivona please send your request to bivona@italianside.com.